PokerNews Cup Main Event: Con Tsapkounis Victorious! After eight days of action-packed poker, the final day of the 2009 PokerNews Cup Main Event final table was icing on the cake of a fantastic championship series. Play seesawed for the first two hours ntil Lawrence Gibson became the first casualty when his was outdrawn by Con Tsapkounis’ as the ill-fated two-outer landed on the turn. Angelo Prifti was next to hit the rail in a rather bizarre hand that became a topic of discussion. After Prifti moved all-in for 873,000 over a Carl Booth 130,000-chip open, Booth sat in the tank for some time before flipping a coin and making the call holding to be behind Prifti’s . A queen on the flop ended Prifti’s tournament as he collected $15,000 AUD for his eighth-place finish as Booth soared further up the leaderboard –- now holding nearly 30% of the chips in play. Tournament veteran Sam Khouiss continued to impart his wisdom to the remaining players before taking out German Marchese in a blind-on-blind battle with Khouiss’ holding true against Marchese’s as the final six headed to dinner. After taking advantage of the many choices that the Crown Casino had to offer, Nino Ascenzio wished he would have stayed for dessert after his was unable to catch against Michel Bouskila’s to exit in sixth place and collect $30,000 AUD. Both Khouiss and Tsapkounis began to chip up while Bouskila went the other way, eventually committing his last few chips out of the big blind with against Tsapkounis’ . Although turning a straight draw, Bouskila was eliminated in fifth place as Tsapkounis pulled into second place in chips before snatching the lead a few hands later. Booth bluffed back into the lead and then sent Khouiss to the rail holding a dominating to Khouiss’ . Both players paired up on the flop, but Khouiss blanked out as he collected $48,000 AUD for his fourth-place finish as Booth held nearly half the chips in play. Tsapkounis then took control of the table when he opened to 250,000 with before calling a three-bet to 750,000 by Booth. On a flop of , Booth moved all-in and was instantly called by Tsapkounis. Booth’s were unable to improve as he slipped to the short stack as Tsapkounis captured more than two-thirds of the chips in play. The quiet but highly skilled and dangerous Joe Cabret found some good fortune against Booth with a two-outer to stay alive before dispatching the one-time chip leader in third place. On a flop of , Cabret called Booth’s all-in holding to be in the lead against Booth’s . The turn and river blanked out and Booth hit the rail in third place for an $74,000 AUD payday as the tournament reached heads-up after just six hours of play. Tsapkounis was straight out of the blocks, first straightening out on Cabret and then improving to two-pair to extend his lead to a near 3-to-1 advantage. Cabret, however, found a double soon after when his held true against Tsapkounis’ to see the heads-up battle return to a virtually even affair. Cabret took the lead before Tsapkounis snatched it back as the following hand played out. Tsapkounis defended from the big blind to see a flop fall and a 350,000 bet follow, with Cabret making the call. The turn landed the and Tsapkounis led for 450,000 with Cabret calling to see the land on the river and yet another bet from Tsapkounis, this time for 800,000. Cabret mulled over his decision for some time before moving all-in with Tsapkounis quickly making the call. Cabret rolled over his , but Tsapkounis’ for a full house put Cabret on the rail in second place collecting $130,000 AUD for his great showing. 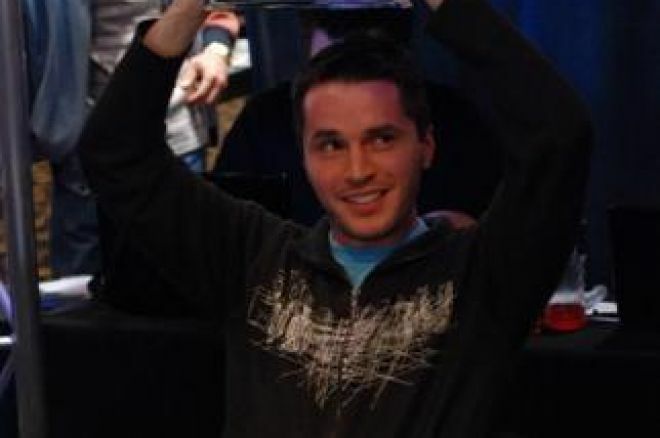 Tsapkounis became the third consecutive local player to be crowned the PokerNews Cup Champion. This cash-game regular and Omaha enthusiast now has an additional $250,000 AUD to splash around the felt as the PokerNews Team waved goodbye to the Crown Poker Room after another successful tournament. Congratulations to 2009 PokerNews Cup Champion Con Tsapkounis for displaying a mix of poise, skill, patience and aggression on his way to besting a world-class field of 381. Follow the tournament trail with the PokerNews Team by making your way to the Live Reporting section for tournament updates from around the world.